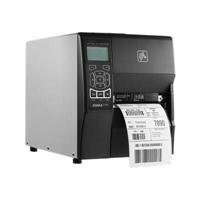 The Zebra ZT230 Industrial Direct Thermal Tabletop Label Printer with metal frame, 10/100 Ethernet connection, and larger ribbon capacity than the Zebra ZT220 prints 4" wide labels at 6" per second and 203 dpi (8 dots/mm). An element energy equalizer (E3) and side-loading metal print mechanism with head open lock help to increase work efficiency. It has an LCD graphical user interface for reading and navigation and 128 MB Flash and 128 MB RAM for high throughput. Media sensors are transmissive and reflective to accommodate different label types including continuous, die-cut, notch, and black mark. Additional connection options include serial and USB 2.0. Thermal printers can be used to print receipts, labels, tags, and other similarly sized media at point of sale (POS) locations. Direct thermal printers and thermal transfer printers use heat instead of ink to print on coated thermal media. A parallel, serial, or USB port allows a receipt printer to be connected to a computer. An Ethernet port or wireless capabilities may enable it to be connected to a computer network. Thermal printers can be used at retail checkout counters and other points of sale. Zebra Technologies manufactures barcode, receipt, kiosk, and radio-frequency identification (RFID) printers and accessories. The company, founded in 1969, is headquartered in Lincolnshire, IL. If you have any questions about this product by Zebra, contact us by completing and submitting the form below. If you are looking for a specif part number, please include it with your message.